I made this baby gift for my best friend who is expecting! 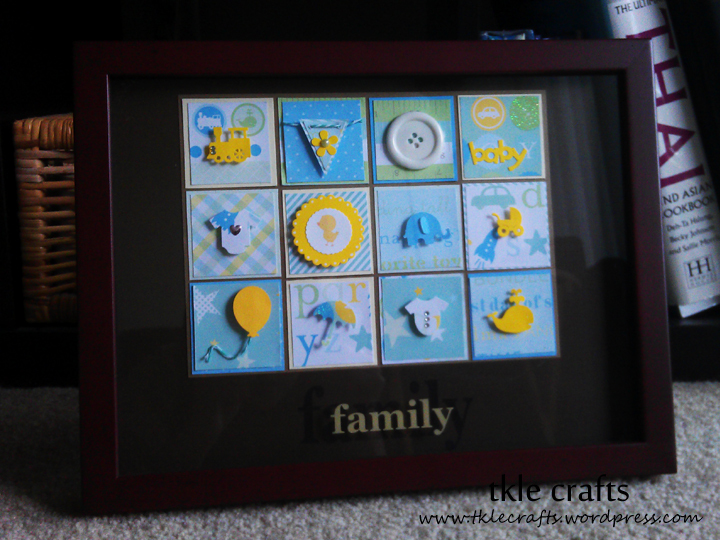 I love this gift because I was able to incorporate the same paper that I used for her baby shower invitations! (Will post invites shortly! 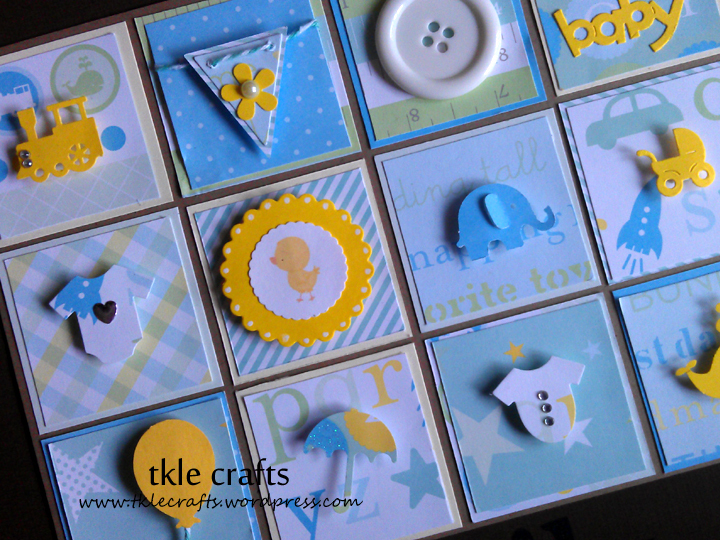 Recipe: Craft paper from Recollections, Scrapbook paper from Martha Stewart, Balloon/Umbrella/Whale/Elephant/Train/Circle Scallop punches from Martha Stewart, Baby Clothes and Banner die cut from PTI, Cuttlebug die cut, Bling, Half pearls, Twine, I-rock hearts, Button. Or however that Dr. Seuss story goes! So I made a few quick treats for my favorite little visitors this weekend! I saw a post on Hostess with the Mostess and thought it was just too cute to pass up. I went to the local candy store and found a bag of colored fishies. (Next time, I will have to try a store like Sweet Factory because they have such a great selection of candies.) Also, it seems like the thicker the gummy the better it looks and will stay put. I did not use skewers for fear that my little visitors would poke their eyes out. Instead, I used lollipop sticks and made a slice with a knife through the top of the candy before sliding it into place. 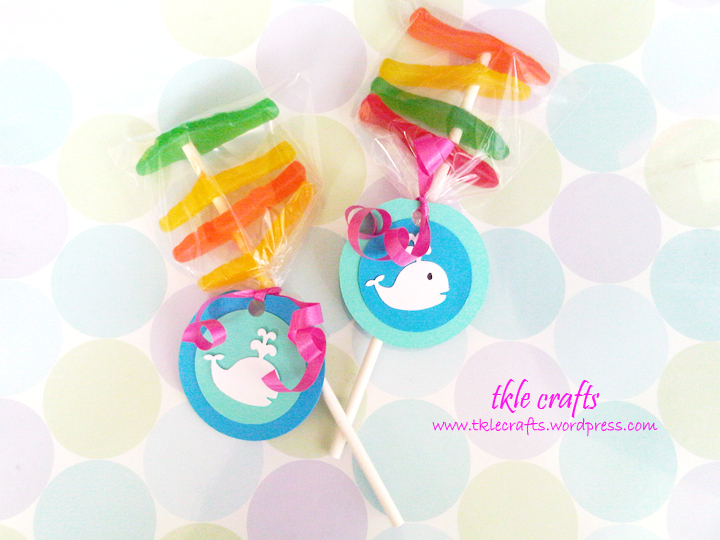 Helpful tip: If you do not plan on using a skewer be sure to make a slice or poke a hole into the candy before you slide it onto your lollipop stick. If you don’t make the slice before hand, all the candy will stick and it makes the lollipop look really gooey. And not very appealing! A Little Fun in Your Pocket! 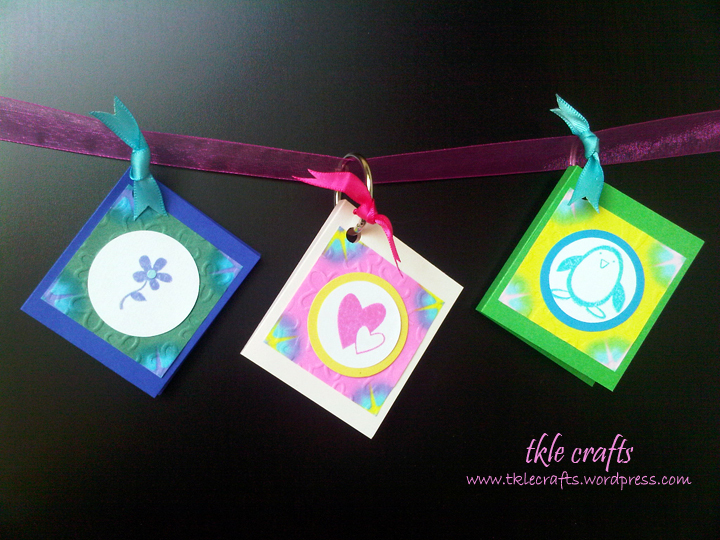 Just when you thought I ran out of ideas, I found another creative Post-it craft! 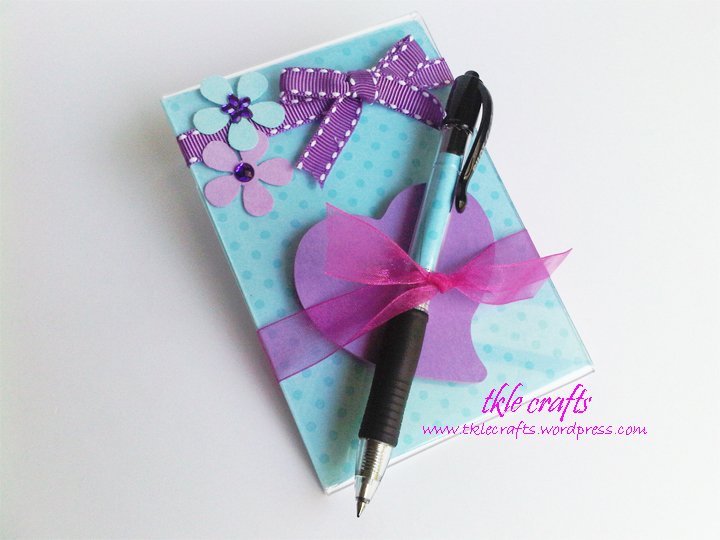 I’m always looking for a pen and piece of paper so this is a great little pocket book to carry around! I love the little stripe pocket where one can stuff coupons or receipts. Normally, I would make 10 of these in all sorts of colors but I’ve decided to make just a few! After watching the tutorial, I made small changes here and there. I’ve considered laminating the covers to make it more durable (or I can just make myself an endless supply!) Hope you love these as much as I do! 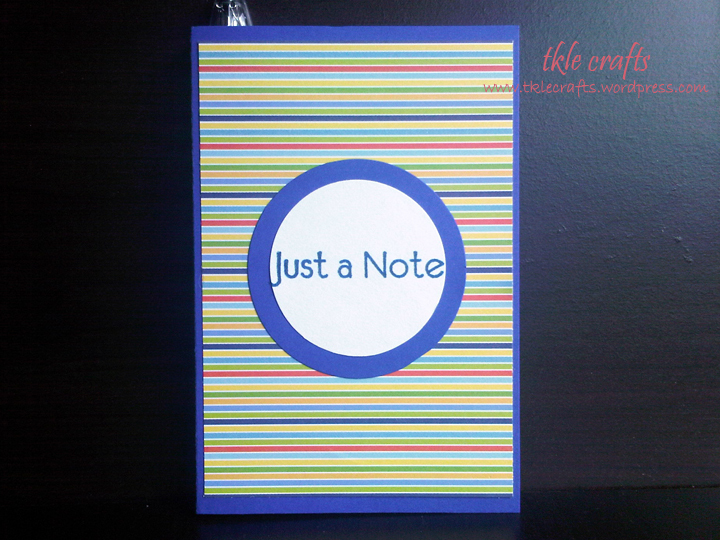 Recipe: Craftstock from Recollections, “Just a note” stamp from The Paper Company, Ink from Classic Stampin’ Up Ink Spots, Stripe paper from Me and My Big Ideas speciality cardstock, RSVP Pentel Pen, Ribbon from Michaels, Cuttlebug 2×2 Flower die cut, Stampin’ up Circle #2 Original Dies, Studio18 Rhinestone Strass, Post-it. Can we say Post-it obsession? 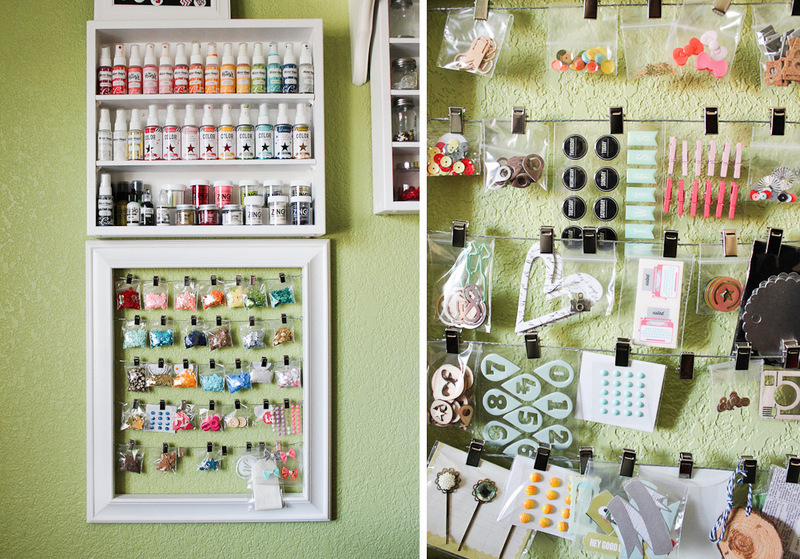 Inside these little creations are Post-it notes! I’ve been determined to incorporate my “retired” origami paper into my crafts and at last, I found a great use for it as background paper! Brilliant! The colors are very vibrant and match perfectly with my ribbon. The four key chains above fit the regular 3×3 post-it. Whereas, the three key chains below are a perfect fit for 2×2 post-it. I decided to make the covers a little larger than the actual post-it so that I could punch a hole only through the front and back cover (or else I’d have to purchase a special hole puncher that can punch through a stack of post-it). 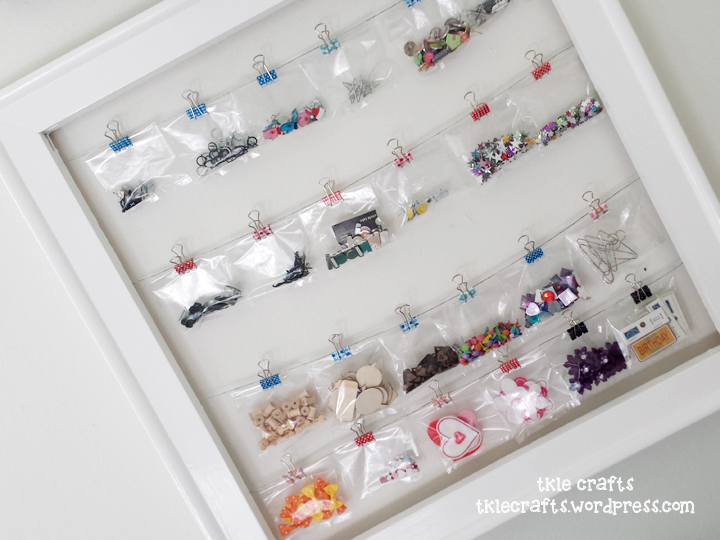 I also used binder rings but you can just as easily substitute key rings. 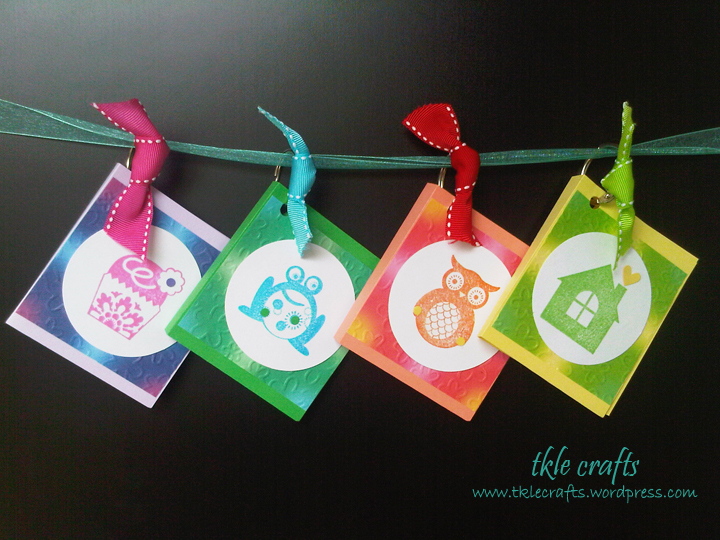 This craft was fun and easy-plus I got to use a lot of my stamps! Enjoy the tutorial! Recipe: All craftstock from Recollections, Stamps from Michaels/Martha Stewart/The Paper Company, Origami paper, Post-it, Ribbons from Micheals, Ink from Classic Stampin’ Up ink spots, Binder rings from Staples, Sizzix Tiny Flowers texturz plate, Stampin’ up Circle #2 Original Dies, Cuttlebug 2×2 circle dies. Just like the song, every time I get an inspiration, I cannot help myself. 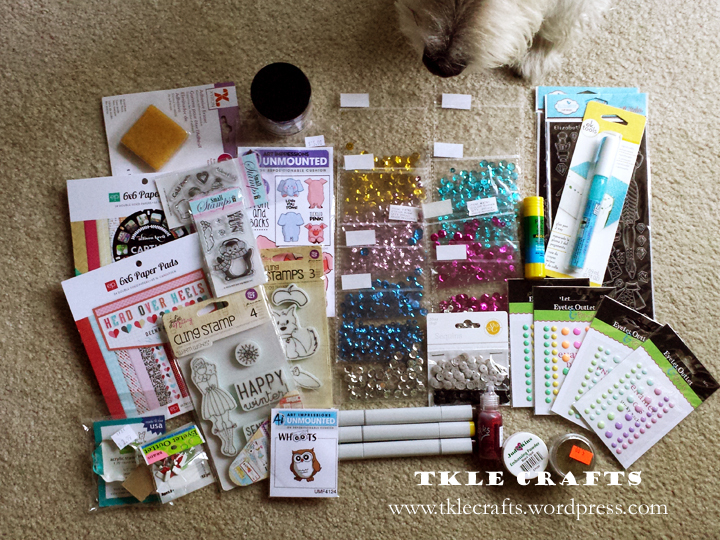 This translates into me traveling to every craft store in order to make sure that I get all my goodies! 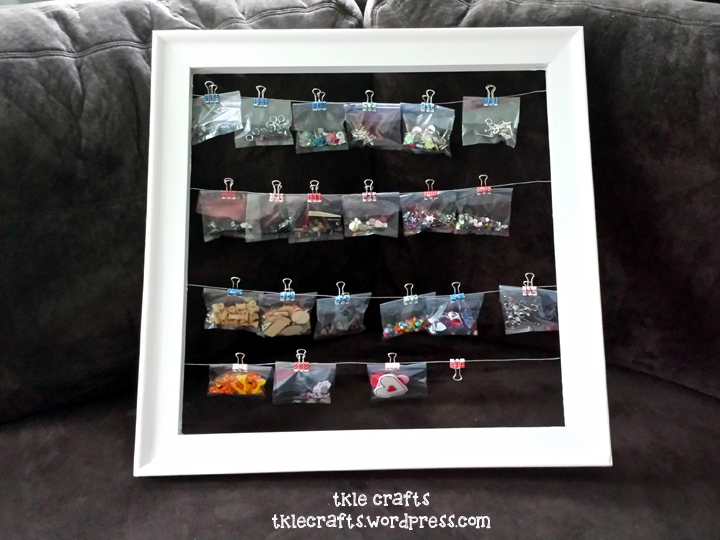 For instance, I wasn’t happy with making only two of these cutie post-it holders, so I ran out and bought 10 more clear picture frames. 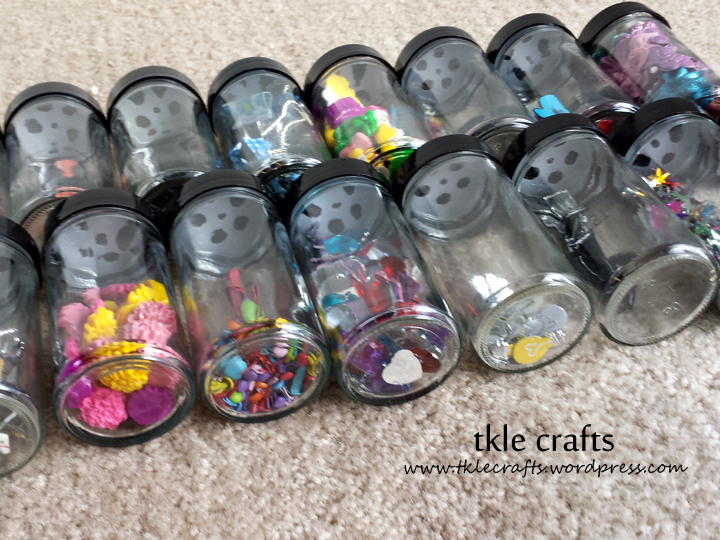 Seriously, I’m building an empire… one craft at a time. lol. I’m really happy with the way the blue polkadots post-it holder turned out and am considering re-vamping the pink hearts post-it holder. Maybe the post-it pads need to match the top ribbon? Or am I missing a heart punch? 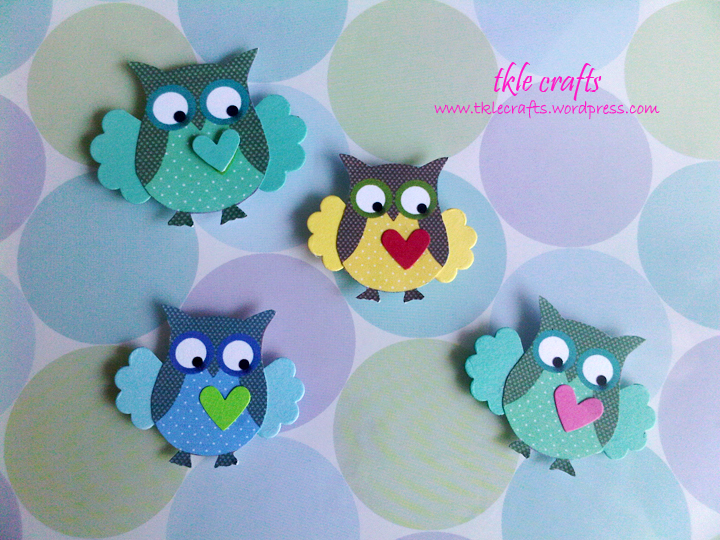 All things considered, I just love they how cute they turned out! A lil’ sugar and spice and everything nice! Seriously, can it get any cuter? 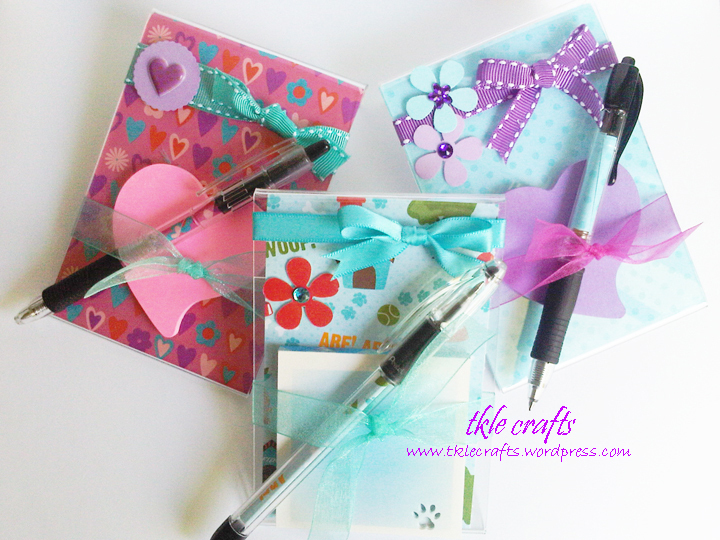 I absolutely love this great idea of adding a little cuteness to post-it notes. 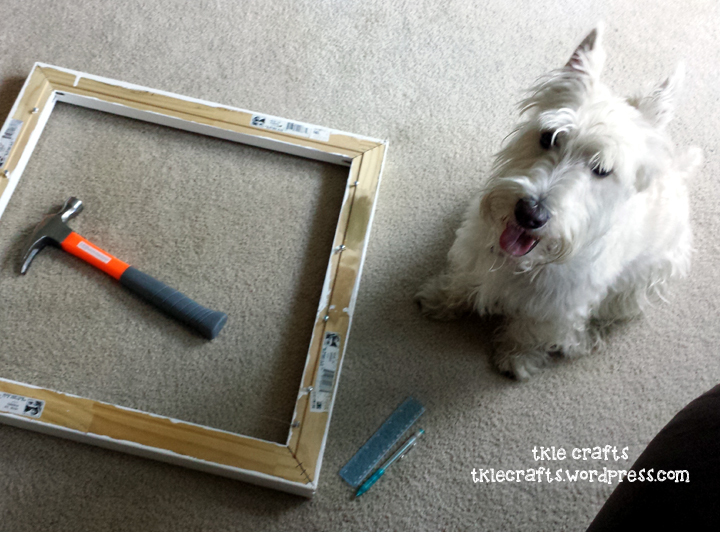 I started off with a clear plastic picture frame and simply added scrapbooking paper, ribbon, and a flower. 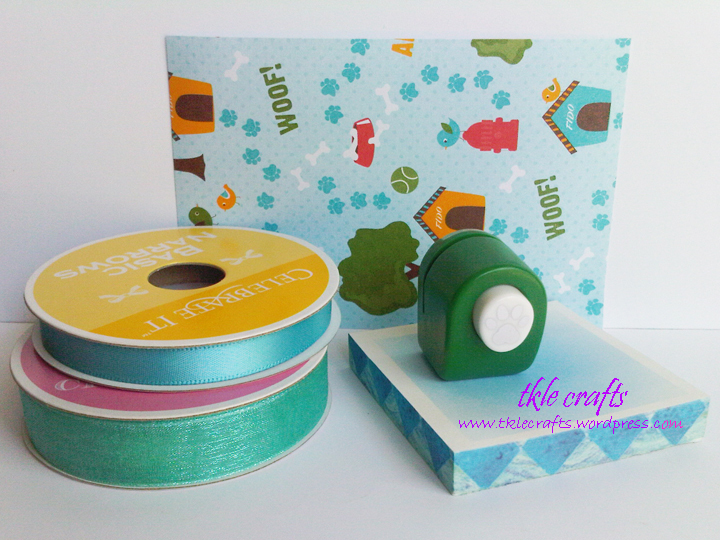 Using the doggie themed craft paper was my favorite part because I added the matching craft paper inside the pen and punched out little paws at the corner of the post-it! Recipe: Acrylic clear plastic picture frame (approximately 3″x5″), Blue satin and Sheer Blue ribbons from Michaels, Paper Shapers Retro Flower punch, Studio18 Blue Rhinestone Strass, Doggie paper from Scrapbooking & Paper craft supplies, Pentel RSVP ballpoint pens, Paw mini punch, Blue post-it notes. 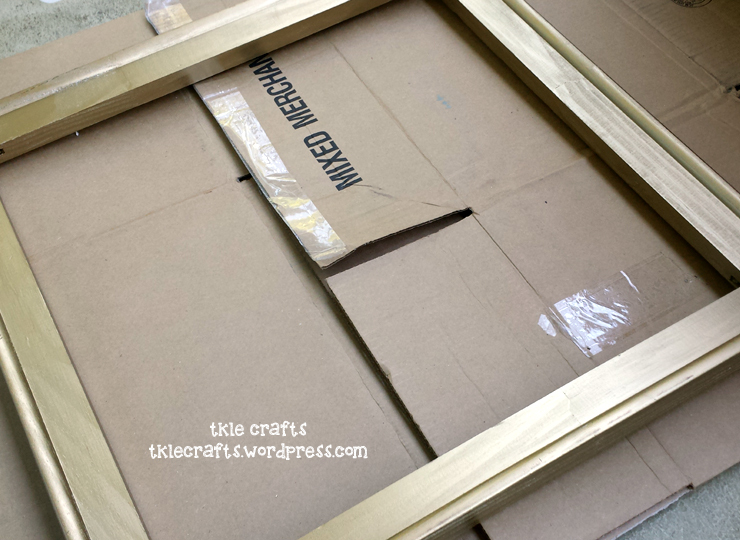 Love Me a Gable Box! Who knew that one could fall in love with a box? 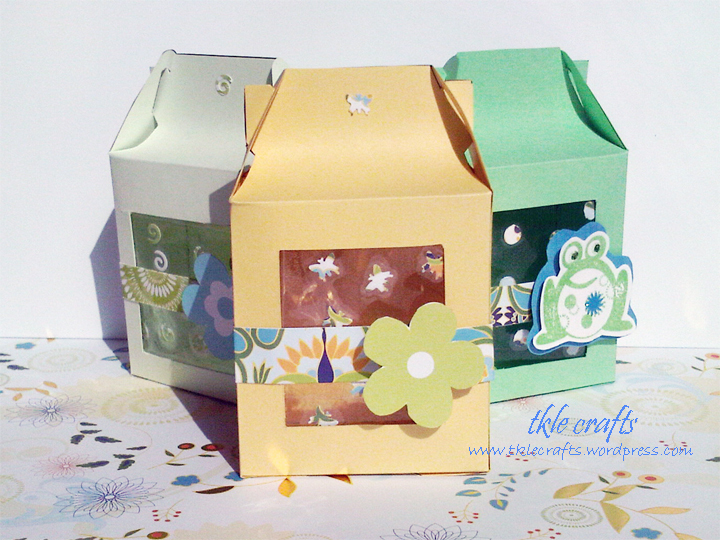 I came across the idea for gable boxes while I was searching for some craft-inspiration. At the time, I didn’t have the Big Shot Machine so I printed the GableBox Template onto my craftstock and hand cut each of the boxes. 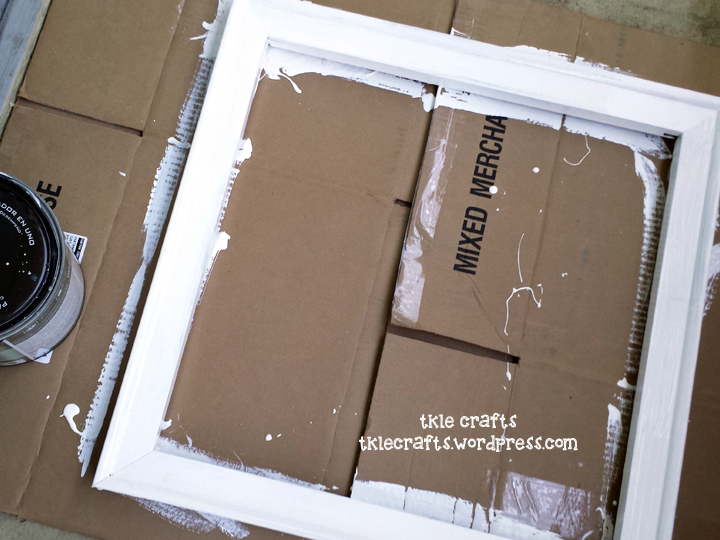 I decide to add a little window to the boxes by cutting out a simple square shape in the front. 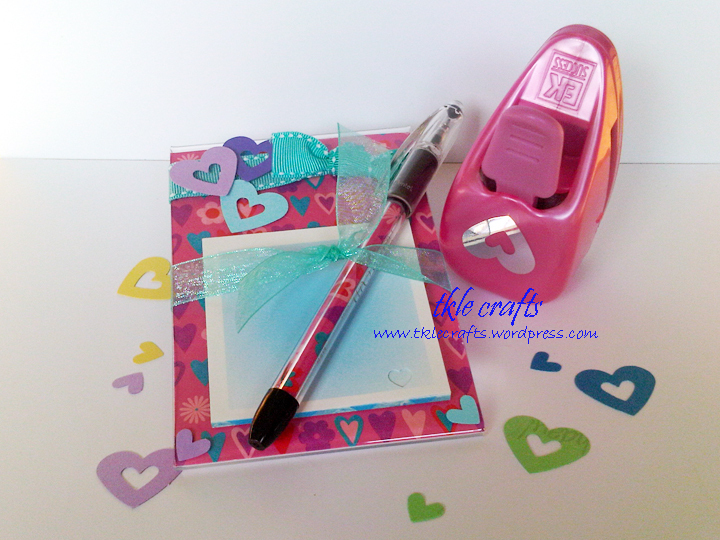 Using my mini punches, I added little punch outs of swirls, butterflies, hearts, etc. 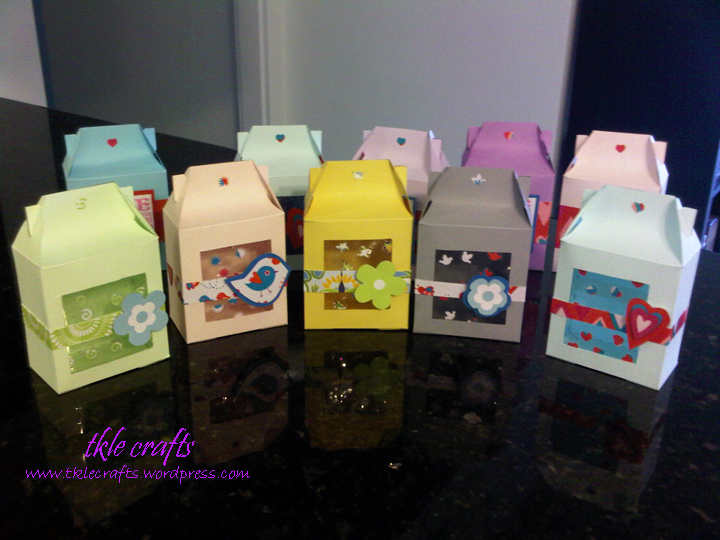 The strips that wrap around the boxes are from various scrapbooking paper. What was great is that some of the scrapbooking paper already had shapes like hearts, birds or flowers which I cut out and used. These make adorable wedding favors, party goodies or gifts for any occasion. So far my favorite goodies to put inside are Ferrerro Rocher Chocolates which end up being pretty tempting to eat before it makes it into the box! 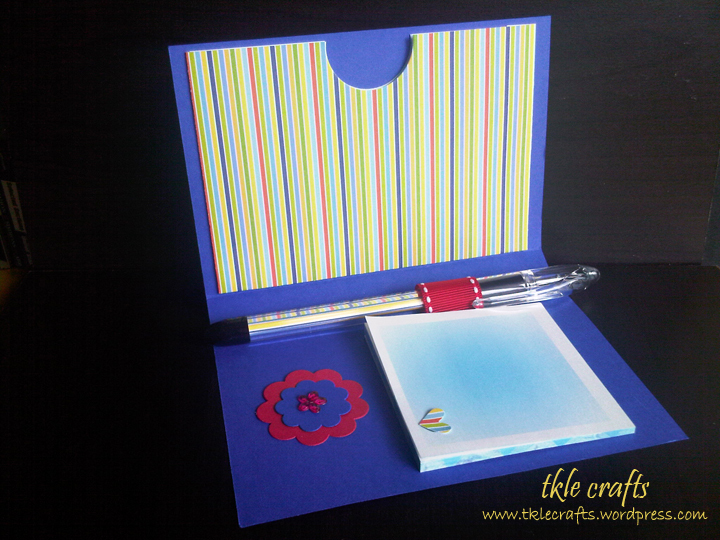 Recipe: Various colors of Martha Stewart craftstock, Mini punches from Paper Shapers, Frog stamp from Michaels, Various craft paper from Scrapbooking & Paper craft supplies, Me and My Big Ideas speciality cardstock.